The head is solid 10k and has a genuine diamond. Not sure of the gold content of the pointed pin part. This is an antique 14K gold stick pin. The top is white gold and the pin is yellow gold and they are both 14K. It has very fine nice work. It weighs 1.5 grams. Antique red garnet stickpin set in 9K yellow gold. Pin shank is 2 1/2" long, overall length is 2 7/8". Original garnets. Gold Filled ?. lets keep it that way! M issing a pearl. Has light wear.Antique Seedling Pearl Gold Tone Victorian Stick Pin. NO MORE EXCEPTIONS. Many signed and unusual pieces. Our offices are smoke free, but can not account for previous owners! Excellent Condition. Material =10k. Category: Pin. Weight =1.3g. For consideration, a lot of 4 antique 10K & 14K Gold Stick Pins. Two are marked and the other two have been tested with a kee gold tester. Material 14K & 10K Gold. Purity 14K, 10K. Markings 10k, 14K. For consideration, a lot of 5 antique 10K & 14K Gold Stick Pins. They have all been tested with a kee gold tester. Material 14K & 10K Gold. Purity 14K, 10K. Markings 10k, 14K. Weight(grams) 9.23 grams. It looks like there is a Pearl on the side round?. lets keep it that way! The top of the pin is 5/8" x 3/8". Enlarge all pics for best details. Starts low with no reserve. 2.5" long. Not quite 3/8". 1.66 grams. Offered for sale is a gold stick pin with a 6.4mm pearl and 3mm diamond. The head is 3/4" tall and it is 2 3/4" over all. It is not marked but tested and guaranteed 14k solid gold, 1.7 grams. Excellent condition. The box is velvet with a mother of pearl push button clasp. It is 3 1/2 x 1 1/4 x 1 1/8". Some wear on the corners and inside. Hinges and clasp work properly. Wonderfully crafted and skillfully designed this stick pin is made from 14K yellow gold and features a white gold crown head (possibly rhodium plated yellow gold) with eight 2mm round old cut diamond accents. It's marked 10K on the stem. See last pic. It's very small. One seed pearl missing. Unless there is a heavier item involved. For restoration. This Stick Pin has its original holder at the bottom. It is marked 333, which is 8K Gold. Antique Victorian 14k White Gold Carved Coral Hat Stick Pin w/Original Case 2.5"
I do not know if the diamond is real. The pin is gold, and I'd say probably real gold. Under a magnifying glass, I can see a tiny number 4, but the area to the left of the number has been worn smooth. For sale is a beautiful signed OB - Ostby Barton - 10K solid yellow gold stick pin. In a beautiful Art Nouveau design, with a center garnet and 3 small seed pearls as accents along the textured leaf. Antique Gold Mining Miners Pick Stick Pin Lapel Pin. Excellent Condition. Category: Pin. Material =800 Silver. Weight =1.4g. It features 3 pearls in a twisted setting. 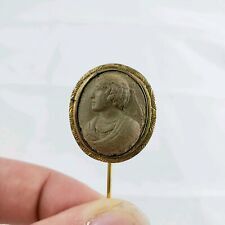 This beautiful antique gold stick pin is. 2.5" long. Marked GERMANY on clutch. Exquisite Stick Pin. Stamped on the pin. Weighs 2 grams. Antique Sapphire ?. Well maintained, pre-owned condition. Very slight bends to it as it has been used. Great addition to any collection or to begin with. We will be happy to list them for you. One is marked Avon. The others have no markings. These belonged to a deceased elderly relative and the proceeds will go toward the funeral costs. Stick pin holding an arrowhead. It is in good wearable condition besides that flaw. None of these are marked but all tested as 10k solid gold. From various local estates. Small lot of antique jewelry, sold as is/ as found. Lets keep it that way! Maybe gold filled cased. and is 6 7/8" long. I also try to find and fun/exciting & unusual pieces. Offered for sale is an antique stick pin with a four leaf clover. The head is 7/16" diameter and the pin is 2 1/8" long. Nice enamel, pin has been bent a little. This is a Gorgeous Antique 14K Yellow Gold Stick Pin. The griffin design features a ruby and seed pearl. Watches have not been checked for timing. We are here to exceed your expectations. After 20 years, I have decided to part with my collection. GORGEOUS ANTIQUE 10K YELLOW GOLD STICK PIN. OPAL CENTER WITH PEARL. HALLMARKED 10K. SLIGHT BEND TO STICK PORTION - AS SHOWN IN IMAGES. There are several duplicate designs, but most are unique. ACID TESTED 14k GOLD BY A JEWELER. TOTAL WEIGHT IS 0.9g. See photos. Item sold as is, as shown. I will let you know if it is possible. This is an antique stickpin from the Dave Fiscus estate. It has a handwritten note included that says "My mother's pin given to her by myself in 1920 (Edith Fiscus)". It's in good condition- needs cleaning and/or polishing but no content information on this. Red Stone Cab Stick Pin Unique. lets keep it that way! VERY OLD AND IN NICE PRE WORN CONDITION. LOVELY FIREY OPAL STONE IN ART DECO SETTING. Pin is in very good condition. See photos. From an estate of Victorian jewelry. Stick pin 2 1/2" long, weighs. 8g. We try and do research on every item, but may not have the detailed information that an expert would be able to provide.